Aadhar card, a unique 12 digit identification number issued by the Government of India through Unique Identification Authority of India(UIDAI) is now a must document in India. If you are a Punjab National Bank(PNB) Customer, now linking Aadhar card to PNB bank account is must as you can get many government scheme benefits. Also Govt. of India has made it compulsory to link Aadhar to PNB Bank Account and if you fail to do so till December 31st, 2017, your PNB account would be made inactive. So, please go ahead and see the below steps for How to Link Aadhaar with PNB Bank Account. How to link Aadhaar with PNB Account Offline? 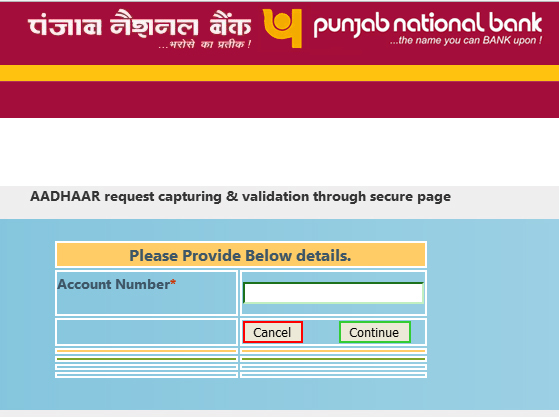 Linking Aadhaar Card to Punjab National Bank offline process requires the applicant to visit Punjab National Bank branch. Visit your/nearest Punjab National Bank branch. Be prepared for original documents for verification which would be returned after verification. After the PNB Aadhaar Link is successfully done, PNB sends a confirmation to the applicant via SMS or email. How to link Aadhaar with PNB Account Online? This is so easy and hassle free process when you link Aadhaar with PNB Account Online. Customers who wish to seed aadhaar in accounts/authenticate already seeded accounts, it must be noted that PNB seeding/authentication is OTP based and only those customers whose mobile numbers are updated in bank accounts as well as in aadhaar database can use this facility. Visit the official website of Punjab National Bank(PNB) PNB Aadhaar OTP. A New window opens. Enter your PNB Account No. in the space provided. After OTP is validated, another page opens where you need to enter your Aadhaar Number. Enter Aadhaar Number click on "continue" Button, then you will get OTP on registered mobile with UIDAI. Enter the received OTP from UIDAI and validate it by clicking on "Validate " Button. After it is successfully done, you will be shown your personal details.